You’re listening to the Sidepodcast mini series F1 Circuits Past and Present, a second series that looks closely at tracks that have hosted the sport across the years. This is the fifth episode, and time to look at a classic track that has made an impressive name for itself despite featuring on the calendar on only two occasions. For a track that held only two Formula One Grand Prix events, the Ceasars Palace circuit has earned itself quite the reputation. The race had previously been held at Watkins Glen, but after mounting concerns regarding safety issues, crowd control and unpaid debts, the track was dropped from the calendar. The US still had a strong presence in the sport, with the United States West event scheduled to start the 1981 season at Long Beach. F1 bosses wanted more, though, and looked around for another potential candidate for hosting a race. They opted for the rather bizarre setting of the car park of the Ceasars Palace hotel in Las Vegas. It seemed like an odd choice, but the idea was to improve the public perception of the city, and of course shine a spotlight on a potential tourist destination. Bookmarking the 1981 season, the Ceasars Palace Grand Prix finished off the year in the hot and dry desert conditions. Although a race in a car park might sound less than professional, the track was well put together, it just still wasn’t popular with drivers. One of the few anti-clockwise circuits, drivers found it tough going due to the strain on their necks as well as the difficult heat conditions. The main problem with the race wasn’t the setup, it was the lack of interest from fans. Even with the 1981 championship conclusion taking place, they couldn’t get the visitor numbers high enough to justify the event. That first race had three potential champions vying for the title, but none of them won the event. Alan Jones, driving for Williams, snatched pole position, stormed into the lead and won the race by twenty seconds. The championship went to Nelson Piquet, who finished fifth. It was lucky that he didn’t need to climb the podium, as Piquet was suffering severe physical exhaustion and reportedly took a quarter of an hour to recover himself. The 1982 season actually featured three US races, with the United States Grand Prix West as the third round of the season, the Detroit Grand Prix halfway through, and our Ceasars Palace once again rounding out the year. It was set to decide the championship for the second season in a row, with Keke Rosberg going head to head with John Watson. Alain Prost had pole position, but dropped to fourth by the end of the race. Michele Alboreto won in a Tyrrell, with Watson second, but Keke Rosberg’s sixth place was enough to secure himself the World Championship. Formula One decided the US had enough of a presence in the sport to risk losing one event, and dropped the Ceasars Palace race after just two years. The track continued to be used for the CART series for another two years, but then dropped out of motorsport completely and was redeveloped, being covered over with buildings. An attempt to bring a Las Vegas race back to the calendar was considered just before the turn of the millennium, but with the car park covered over, there was no space to build a track, and no one could quite agree where the best spot would be. Instead, attention turned to the Indianapolis Motor Speedway, which went on to host the US Grand Prix from 2000 onwards. 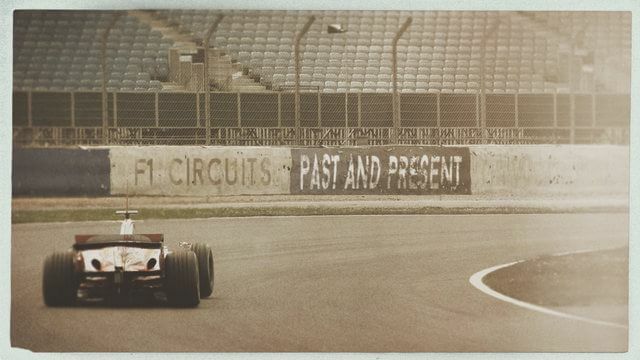 That’s all for this episode of F1 Circuits Past and Present. If you’re interested in learning more about Keke Rosberg, then do have a listen to the first episode of Racing Families, another mini series from Sidepodcast taking a look at motorsport family trees. Thank you for listening, as always, and check right back here tomorrow for our penultimate F1 Circuit.